With the cost of living hitting unprecedented high everywhere, saving money is on top of everybody’s mind. This is especially true when one is shopping for a new car. Tough economy coupled with all kinds of taxes make it nearly impossible to bargain for a fair price. At such times, salvage cars may be an option. A salvage title car is one that has been involved in an accident and hence substantially damaged. It is deemed a total loss by an insurance company. Typically, owners of such cars are paid off by the insurer and the insurer takes possession of the car’s title. The insurance company is interested in getting rid of these salvage vehicles. Herein lies your chance to buy a car. You may think the damage is repairable or at least the damage doesn’t look that bad from the outside. But before you hand out the cash, weigh all the pros and cons to purchasing a salvage car. There’s only one advantage to buying salvage cars at auctions but it is a big one. You can save a whole lot of bucks. In fact, this is the main motivator for going for a salvage car. Salvages are cheap compared to those at the dealers. 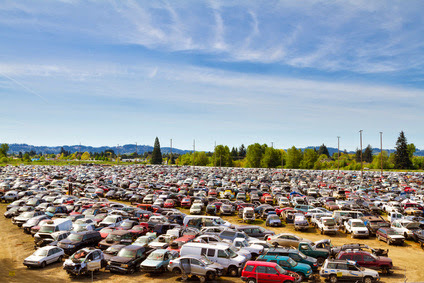 Salvage cars may be looked upon as a treasure trove of spare parts. Many buy them for just that reason. Otherwise, one may repair the vehicle and use it as long as the vehicle permits. The offer price isn’t the only cost associated with wrecked cars up for sale. Sometimes the damages to such a vehicle can be extensive but not easily detected initially. You need to evaluate the total damage and calculate the amount you’ll incur on fixing it. Repairs consume a lot of time and money. You may even need to hire the services of a professional mechanic, which comes at a price. Once a vehicle is written off as a total loss by an insurance company, the title stays forever. That remains true even if you rebuild the car to a useable condition using used and new parts. You have to get it inspected and approved by the Department of Motor Vehicles as road-worthy. If you crash the vehicle, it will be considered totaled again. Insurance companies are still reluctant to introduce a comprehensive policy on rebuilt vehicles. Their main argument is that if the rebuilt vehicle gets into an accident, the insurer will have a hard time figuring out whether the damage is attributable to the new accident or it is pre-existing in the salvage. Also, once a vehicle was deemed unfit to drive on the roads, the chances of it breaking down again are high. So, finally the question is, is a salvage vehicle even worth purchasing? If you are game to work on a banged-up car by investing the required money and time, work with your insurance company, and do a mountain of paperworks, then nobody can hold you back. The amount of money saved on repairable salvage cars for sale must be in balance with the costs of repairs, if any. Get the vehicle inspected by a trained mechanic before purchasing to make sure you form a clear picture in advance and don’t face problems going forward.